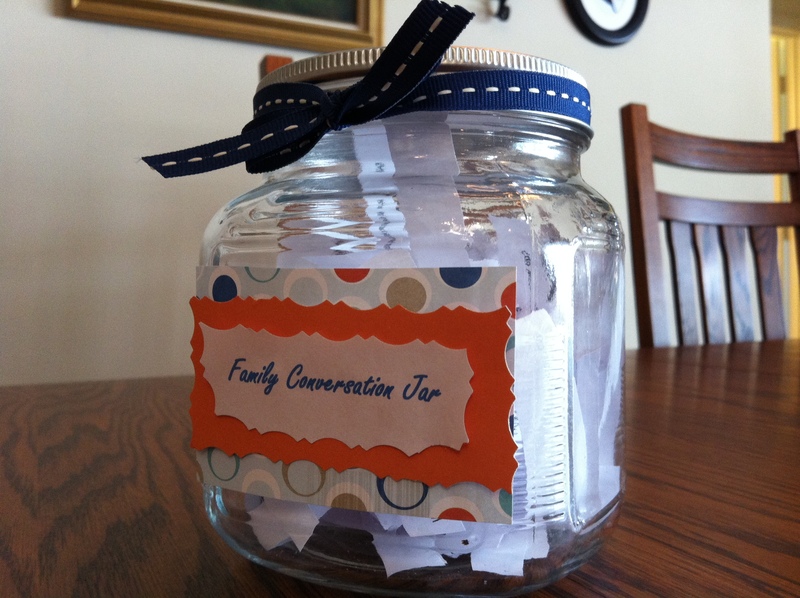 To bring that focus back to Christ during the holidays, you can make a conversation jar to steer you in the right direction. Purchase a Christmas jar or canister, or decorate one of your own. On 2″x4″ strips of paper, write questions that pertain to Christmas. Fold the strips and place them in the jar. 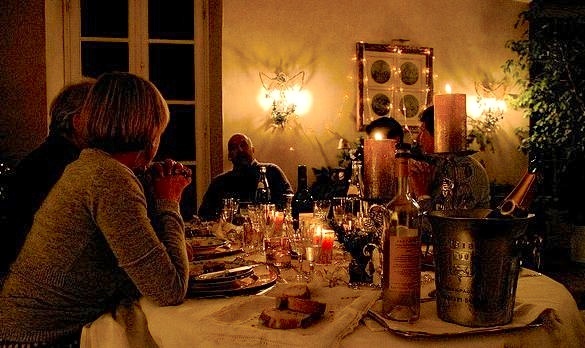 During dinner each night in December, have a different family member pull a question from the jar. Then go around the table, taking turns giving answers. Here are a few questions to get you started, but part of the fun is coming up with your own. Describe the sounds that might have been heard in the stable on Christmas night. Who do you think took care of the sheep when the shepherds ran off to see baby Jesus? Describe a Christmas tree to a blind person. What do you think the wise men wore when they visited Jesus? What smells do you imagine were in the stable? What do you think the animals were thinking when Jesus was born? What is your favorite Christmas present ever? What Christmas tradition means the most to you? How much light does it take to drive out darkness? What are some amazing facts about the Christmas story? What is your favorite Christmas smell? What is your favorite Christmas food? What is your favorite Christmas memory? Describe how the sky looked when the angels appeared to the shepherds. Which person in the Christmas story would you like to have been? 5. Put up your Christmas tree – get everyone around to decorate it. 6. Teach the children about St. Nicklaus, the generous 4th century Turkish bishop. 7. Set up the Nativity scene – remember Baby Jesus isn’t there yet, nor the Kings. 8. Christmas is a season – not just one day. 9. Simplify. Alter traditions to suit YOU and YOUR family. Simplify. 10. Put aside (hide) or make biscuits and other treats to put in the freezer now. 11. Invite your neighbours over for a barbecue – be as lights in the world. 12. Have a gift card making session with your children, maybe invite some friends over. 13. Wrap the presents and place in a ‘safe’ place. 14. Make an Advent chain with 10 loops of paper and countdown – take off one each night and read the Bible verses or love notes (from God) you’ve written inside. 15. Together recall the enjoyable memories of Christmas past. 16. Sing carols or put on a music tape to play through the day. 17. Sit outside in the countryside on a fine dark night silently. Think of the shepherds, angels, Mary waiting. 18. Have a family only (half-) day to sit and be and do. Relax – in the park, on the beach. 19. Have an Advent candle lighting ceremony. 20. Go on a pyjama ride with the littlies to see the Christmas lights. 21. Oohh! The anticipation – Jesus, the Way, the Truth, and the Light, is coming. 22. Visit or volunteer at an old folks’ home, women’s refuge, Night shelter. 23. Watch a Christmas video or DVD with your children, telling the story of Jesus’ birth. 24. O Holy Night, … the weary world rejoices for yonder breaks a new and glorious morn. Sing this carol or check out the various versions on YouTube. 25. Happy Birthday, Jesus – Emmanuel, God born as man. Who is coming to your party? Shalom, God is with us! Top Line : Theme for each day. Sing songs, read Bible passages, read stories, do activities. For set times with your family or as you go about your day. Sit outside at night quietly – look, listen. Imagine. Jesus had visitors. Who can we visit?